As I have relatively fine hair I’m always on the lookout for products that will give me a little jujj- is that a real word or have I made that up? Probably. 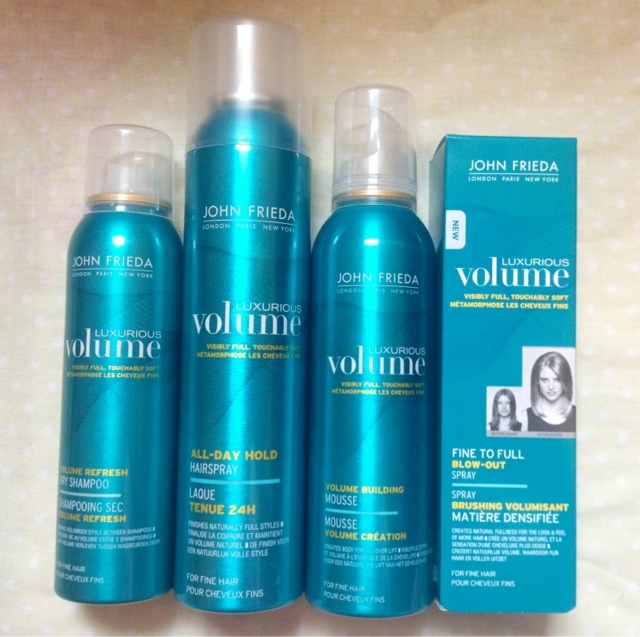 I’ve been recently giving the new John Frieda Luxurious Volume range a good try as I’ve heard great things from their new ranges and I’m a sucker for pretty packaging. All the products in this range are targeted for fine hair and promise to give even the limpest of locks fullness, thickness and lift without weighing your hair down. I threw this in my bag in my packing rush for Paris, which in hindsight probably wasn’t the best time to try a new dry shampoo out in case it was awful and left me with greasy locks whilst wandering around Paris. Luckily though I love this little can of freshness- I used it in the evenings after a full day of walking around Paris and it completely spruced up my hair leaving me with a refreshed, fuller look. My only issue with this compared to my usual dry shampoo is that you are sometimes left with little white flakes that look like dandruff but they brush out easily enough so it’s not a huge problem. But on the plus side it doesn’t spray out as huge white patches as it’s a relatively fine mist so it gets a thumbs up from me! This is by far my favourite product from the range, I’ve recently been so in love with the volume range from Bumble & bumble and I feel like this product really rivals their range and at a fraction of the price! You simply spritz the product through the roots and lengths of wet hair, brush through and then dry your hair. I must admit I was a tad nervous to spray this on my roots as I didn’t want to be left with sticky, greasy roots but this leaves virtually no residue on the roots and leaves your hair beautifully fuller and smooth. Even though I’ve only used this a few times I already know this is going to have a firm place in my styling routine. Now I’m not a huge user of hairsprays so I can’t comment on anything too specific as I don’t really have anything that I really look for in a hairspray- other than not making my hair crispy (yuck). However, I can say that I like the smell of the John Frieda hairspray and the fact that it only sprays a light mist over the hair providing hold without weighing the hair down. Overall I do like it and would recommend it to a friend, but like I said, I’m no hairspray expert. I may be no hairspray expert but I’ve tried my fair share of volumising mousses to control frizz and add a bit of something to my hair and I really think like this is a great product for doing exactly that. Again I really feel this range is rivalling the Bumble & bumble volumising collection and as I’ve used both mousses I can say that they pretty much do the same for my hair, which I love as it’s very rare to find one product you love let alone two! Overall I’m pretty impressed with the new Luxurious Volume range and think they’re such good quality for the price. If you’ve tried the Bumble & bumble range but it’s a little too pricey for you I’d definitely suggest you give this collection a go. There is also a shampoo and conditioner in this range but I couldn’t comment on its effects as I’ve not tried it out, but I believe Anna from Vivianna Does Make-up rates it, and I trust her opinion so I’d say it’s worth a go!